A deliciously deep filled pie with succulent chicken and tender asparagus in a creamy sauce. 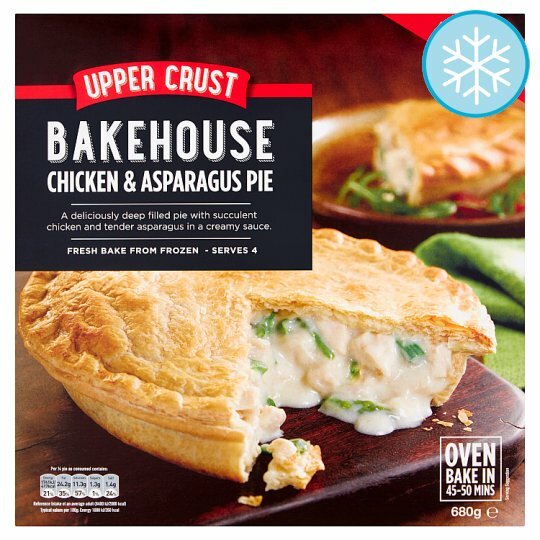 Our secret is keep things simple - our delicious deep filled pies uses premium grade flour to make a crumbly shortcrust pastry base, which we fill with succulent chicken and tender asparagus in a cream sauce topped with a light flaky puff pastry lid. Keep frozen, Food Freezer **** until best before date †, Star Marked Frozen Food Compartment *** until best before date †, Star Marked Frozen Food Compartment ** 1 month, Star Marked Frozen Food Compartment * 1 week, Ice Making compartment 3 days, Refrigerator 24 hours, † Should be -18ºC or colder. Do not refreeze once thawed., See side of pack for best before end date. Oven cook (From Frozen): For best results always bake from frozen.